We all know that grapes and raisins can be toxic to dogs. But why? How should we treat grape ingestion in order to prevent toxicity, and what should we do if toxicity occurs? The mechanism of action for grape toxicity is not actually known. It could be from various components of the grapes, but it is mostly thought to be something in the flesh of the grape itself. Some dogs may develop toxicity from ingesting a small amount, while other dogs may eat large amounts with no side effects. Dogs of any breed or size, male or female, may be affected. 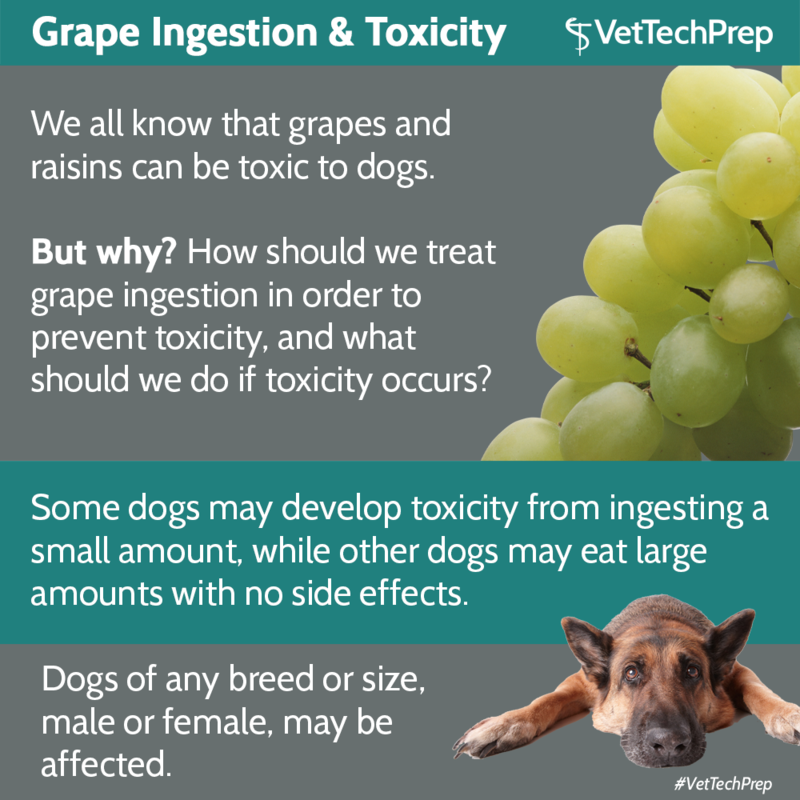 Perhaps there is a genetic component that may make dogs more or less susceptible to the toxin in the grapes? Read about Leah, a little dog who almost died from ingesting only 10 grapes. Ingestion of grapes should always be treated immediately. You simply don't know which dogs will be susceptible to becoming ill. Decontamination is the first step. Induction of emesis will help the dog to expel stomach contents. Grapes and raisins may stay in the stomach for a while, so emesis should be induced, even if several hours have already gone by. Activated charcoal may be administered once emesis has taken place to prevent absorption and bind toxins. In cases where large amounts were ingested, gastric lavage may even be helpful. Intravenous fluids and supportive care are indicated. Labwork should be monitored for 2-3 days post-ingestion. If toxicity occurs, an elevated phosphorus and calcium may be seen initially. The BUN and creatinine may then become elevated. A negative prognostic indicator is decreased urine output despite diuresis. 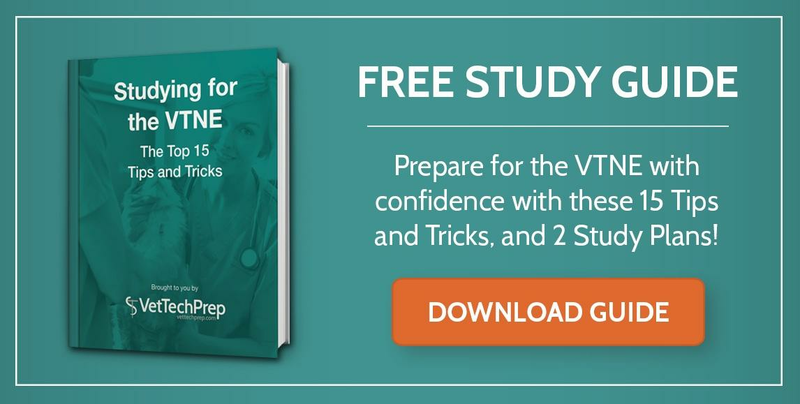 Urine output must be monitored closely, as well as blood pressure, hydration status, and all vital signs. In severe cases, dialysis may be needed. 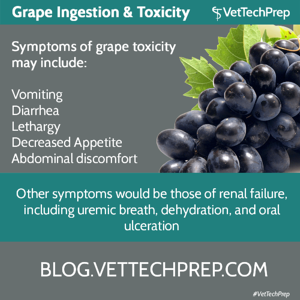 Symptoms of grape toxicity may include vomiting and diarrhea, lethargy, decreased appetite, and abdominal discomfort. 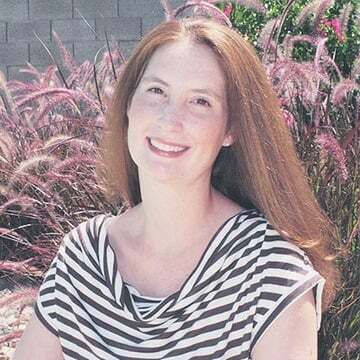 Other symptoms would be those of renal failure, including uremic breath, dehydration, and oral ulceration.